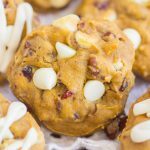 These White Chocolate Cranberry Pecan Pumpkin Cookies are pillowy soft and tender, with all the best cozy spices, and crammed with seasonal faves including cranberries and pecans! 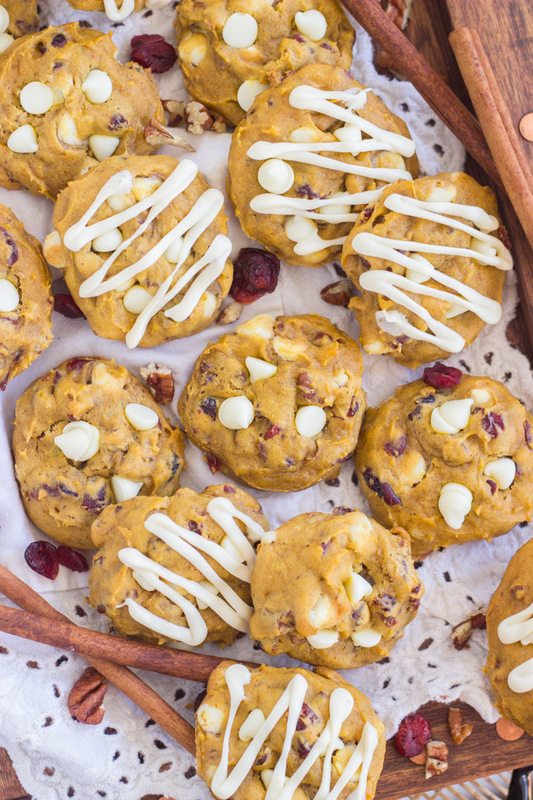 These White Chocolate Cranberry Pecan Pumpkin Cookies are easy & foolproof to make too! 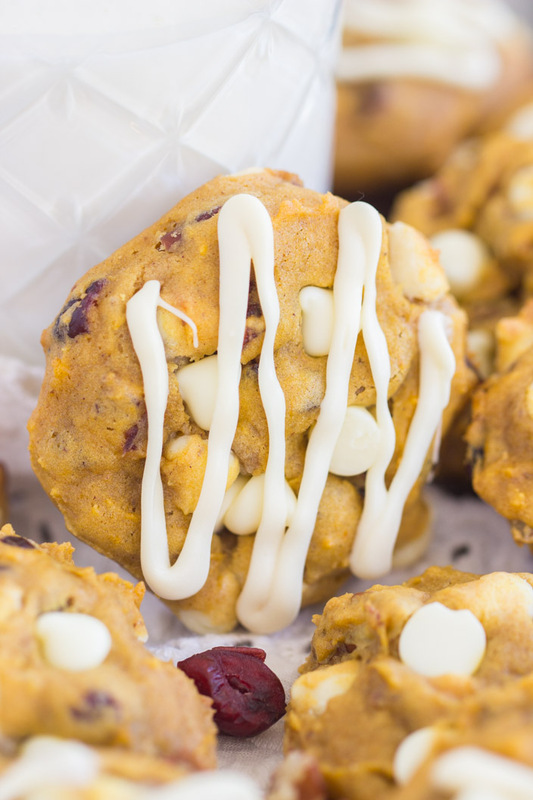 These White Chocolate Cranberry Pecan Pumpkin Cookies are made from these Pumpkin Cookies with Brown Butter Icing… the pumpkin cookie recipe that started the whole pumpkin obsession for me. Seriously. 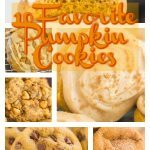 I know that pumpkin has had a moment the last few years and it’s a very trendy food, but my fondness for pumpkin things actually started back around 2003. 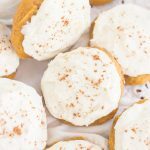 That’s when I found my favorite pumpkin cookie recipe, and I’ve been pretty head-over-heels for pumpkin desserts ever since. Indeed, this Pumpkin Butterscotch Spice Cake Trifle and this Upside Down Pumpkin Cake are also from about 2003 when I really started collecting pumpkin recipes. 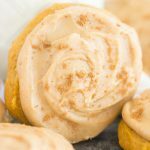 So I’ve been making these pumpkin cookies for almost 15 years now, and I come back to them over and over again when I want a perfect soft pumpkin cookie. They’re pillowy soft, tender cookies, and they’re also very thick cookies! Though they’re not crazy chewy, they still have a bit of chew to them that is super satisfying. I love the texture – soft and cakey, but still dense and substantial. 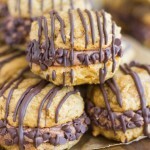 It shouldn’t be only about chewy cookies… chewy cookies always want to hog the limelight. 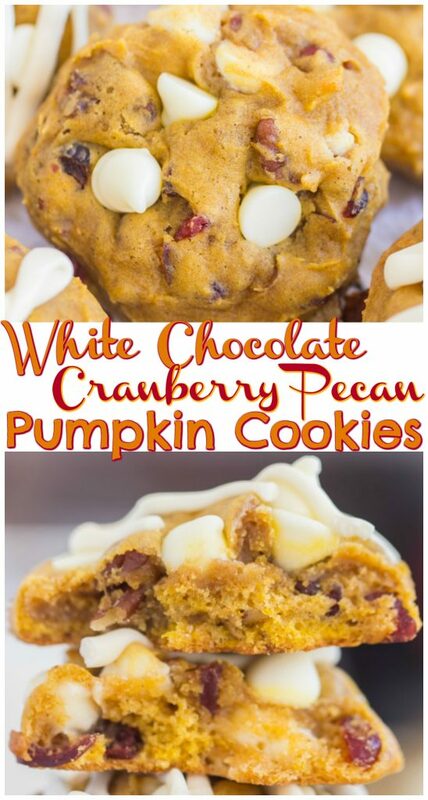 A cakey cookie is amazing too, when done right. These White Chocolate Cranberry Pecan Pumpkin Cookies are soft and tender little pillows of pumpkin goodness combined with the best fall spices, and some of the best ‘mix-ins’. 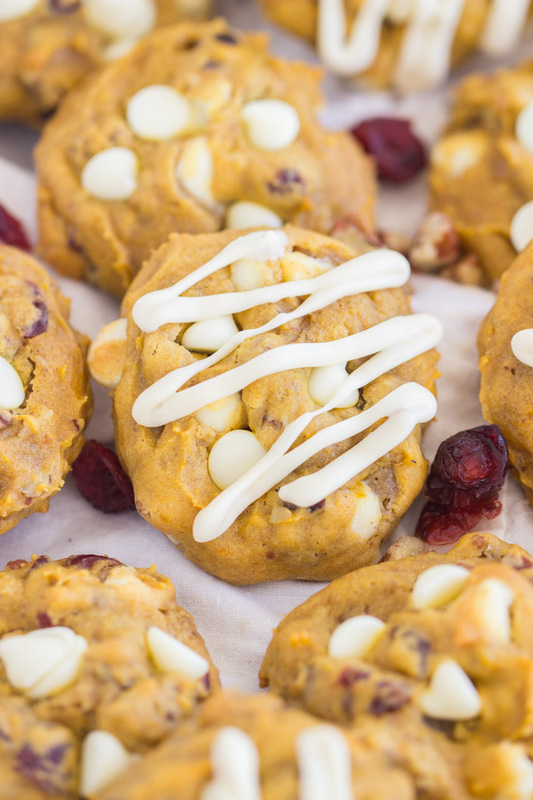 Besides these White Chocolate Cranberry Pecan Pumpkin Cookies, and the version with Brown Butter Frosting, I’ve also used the same recipe to make these Pumpkin Cookies with Cream Cheese Frosting, and these Pumpkin Cookies with Maple Frosting. 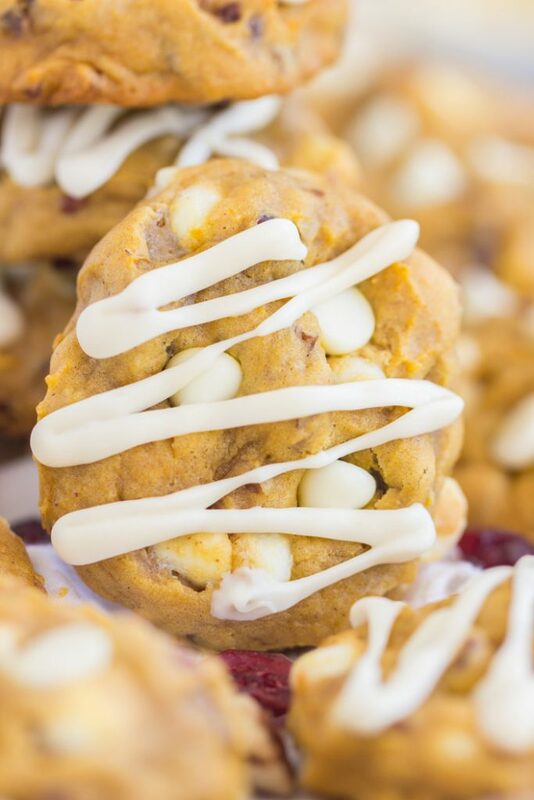 If you are more in the mood for a chewy pumpkin cookie, check out my Soft & Chewy Pumpkin Snickerdoodles, these Chewy Pumpkin Chocolate Chip Cookies, or these Pumpkin Spice Latte Cookies. 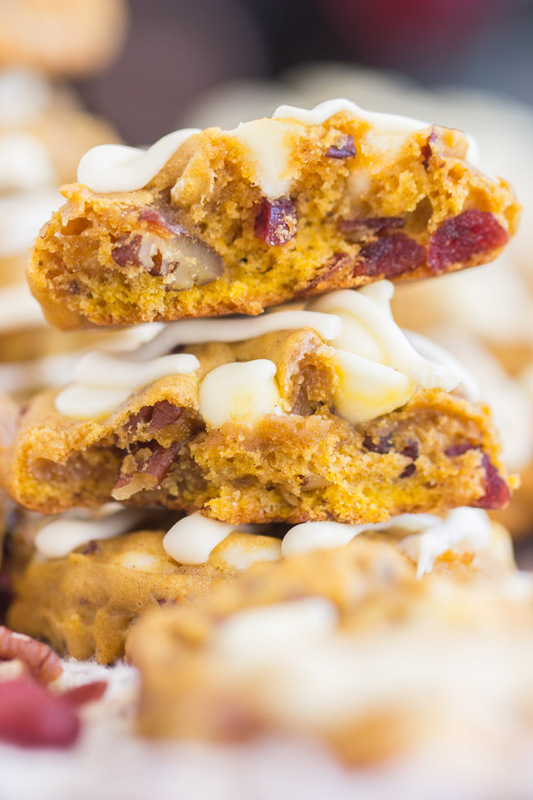 These White Chocolate Cranberry Pecan Pumpkin Cookies are pillowy soft and tender, with all the best cozy spices, and crammed with seasonal faves, including cranberries and pecans! 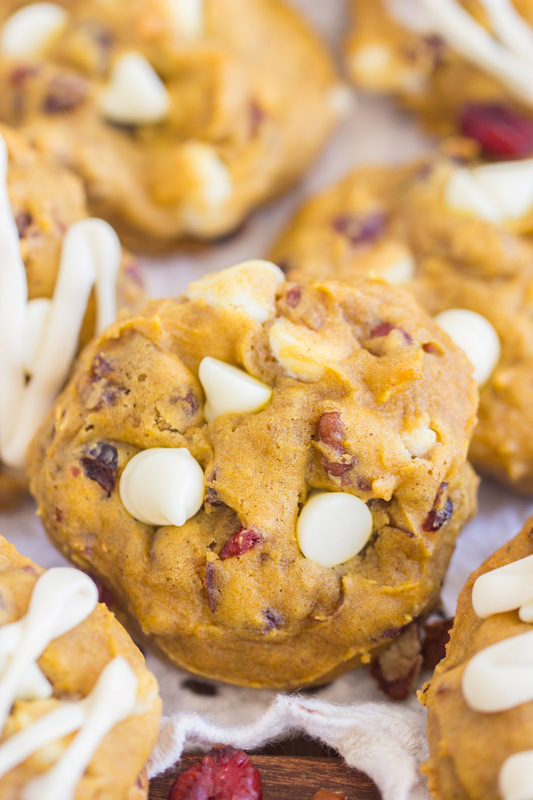 These White Chocolate Cranberry Pecan Pumpkin Cookies are easy & foolproof to make too! In another large bowl, combine flour, baking powder, baking soda, cinnamon, pumpkin pie spice, clove, and ginger. Add dry ingredients to pumpkin mixture and beat until just combined. 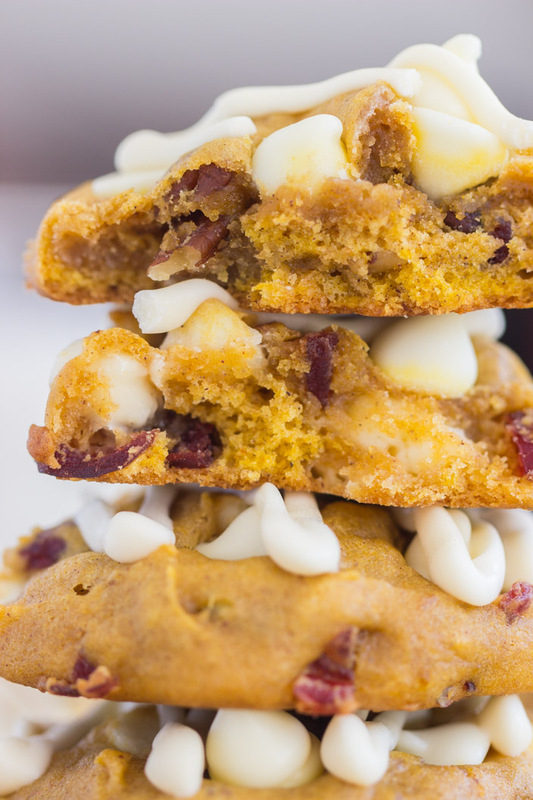 Do not overmix, or you'll end up with tough cookies! 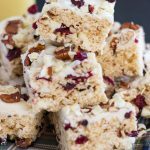 Fold in pecans, dried cranberries, and white chocolate chips. Drop by tablespoonfuls onto parchment paper or silicone mat-lined cookie sheets. Bake at 350 degrees for 10-12 minutes, or until edges are lightly browned and centers are set. In a small microwave-safe bowl, heat white baking chocolate for 30 seconds. Stir, and heat again for 15-second intervals, stirring in-between, until melted and smooth. Drizzle over cookies. Allow to set. Store cookies in airtight containers at room temperature for about 5 days.